A fire in a wall at Graf Brothers Lumber Tuesday was being extinguished by several local fire departments. The extent of the damage was unknown at press time Tuesday. Several fire departments in Ohio and Kentucky were on the scene Tuesday afternoon at Graf Brothers Lumber Co. in South Shore. A fire started in the wall of a building there and as of Tuesday afternoon looked like it had been contained by personnel removing panels from the wall and extinguishing the fire. The cause of the fire was unknown at press time. It appeared the fire was contained in one building. In addition to the various fire departments, which included South Shore, and Lloyd in Kentucky and Washington Fire Department in Ohio, at least three private ambulance services were on hand as well. There were no injuries reported as of press. As to the extent of damage done to the facility, that was unknown as of press time as well. Officials at the plant were still unavailable at press time. 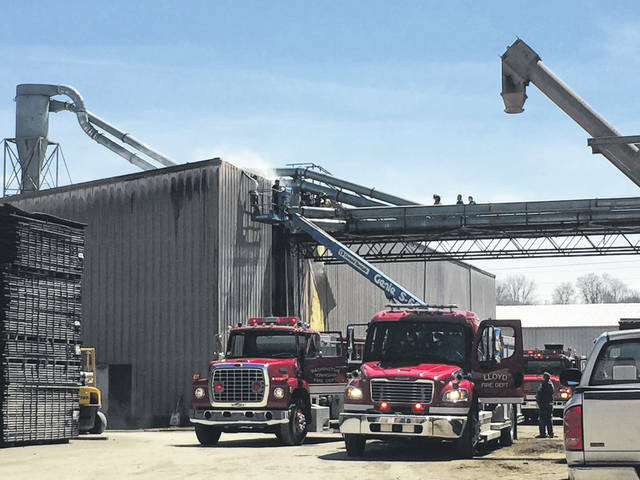 https://www.portsmouth-dailytimes.com/wp-content/uploads/sites/28/2019/04/web1_Graf-Brothers-Fire-1.jpgA fire in a wall at Graf Brothers Lumber Tuesday was being extinguished by several local fire departments. The extent of the damage was unknown at press time Tuesday.